Do you have a toddler that doesn’t talk a lot but points and makes sounds instead of words? If your a mom of a boy or only child you may be seeing the same things in your toddler that we are, so how do you encourage your toddler to talk more without going to a specialist? Our son only likes to chatter in gibberish with some mumbling and pointing to things with the few words that he chooses to use such as the overly used word “NO”. I’m sure all of you parents can relate to this one!!! As parents we always want to fix problems and find a way to help our children so we research and talk to other parents until we figure it out! Like you I was thinking “there should be a way to help him say more words” and since he doesn’t like reading (he uses books as ramps for his cars) that wasn’t an option for us. We stumbled upon this solution accidentally and noticed how our toddler started learning his colors, letters and numbers and talk more then he used to after doing these for a few days!! 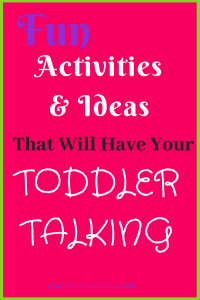 Here is a super simple way to get your toddler interested in learning and how to encourage your toddler by applying these activities to things you do and see every day as a parent it is up to you to help teach your child language skills. By engaging them in everyday activities and identifying what you are doing by talking through the steps you are helping your child form sentences and teaching them how to use words properly. 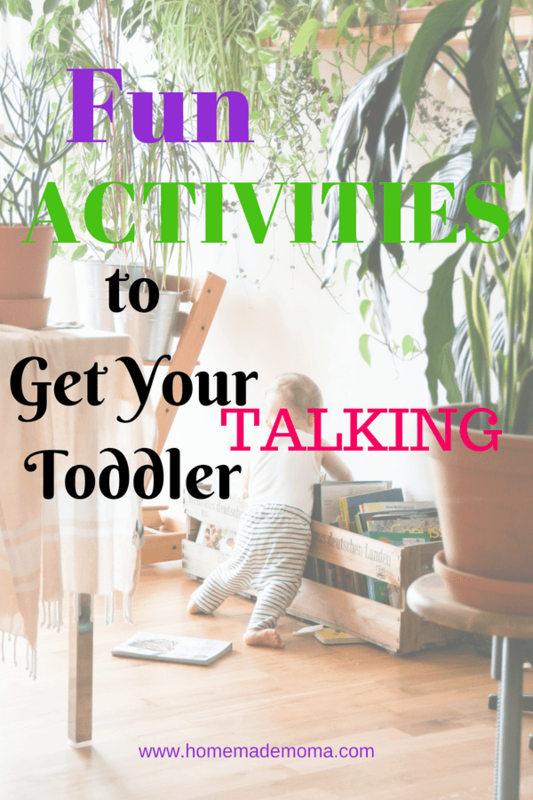 I will go through what we have done to make learning engaging for our toddler and show you how to encourage your toddler to talk more by including these activities in what you do everyday. Every toddler develops differently and faster or slower then others but you can help them grow their vocabulary and make it fun for them at the same time. This is what we started doing to help boost his vocabulary and how you can encourage your toddler to talk. You have all heard of YouTube and the videos you can watch, download or make yourself and it also has shows for toddlers that are fun and colorful! One day my son was watching Sesame Street and in the suggestions we discovered videos called Colors For Children. It has cars and trains and different trucks with multiple colored balls and is set up to keep a toddlers attention and go over the name of vehicles and colors. Within a few days he was saying the colors and the names of the vehicles which blew us away!! I’m telling you this program works and it’s super simple and entertaining at the same time, he can watch it for hours lol but we don’t let him of course. Throughout the day we go over the colors and cars when we see them on the road or in the house, he even plays with his own cars and trucks like they do on the videos and lines them up. I’m not big on putting your kid in front of the TV especially since they don’t learn anything from a lot of the programs they have on, but I have seen a big improvement in his words since we started watching these videos. Another program that most of us grew up with is Sesame Street and by watching that he has started to say the alphabet and count. 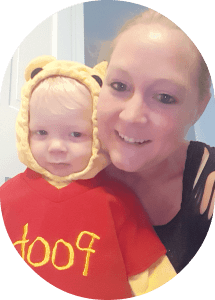 The count makes learning to count super fun for your little one and he is a lovable character along with the many others like Elmo which helps to make learning fun. Since watching these programs he can look at certain letters and tell you what they are even words on T shirts or grocery carts at the store, every where he sees words he is telling me what they are and recently he counted from 1 to 10! I think is a big step for a toddler who isn’t even 3 yet!! 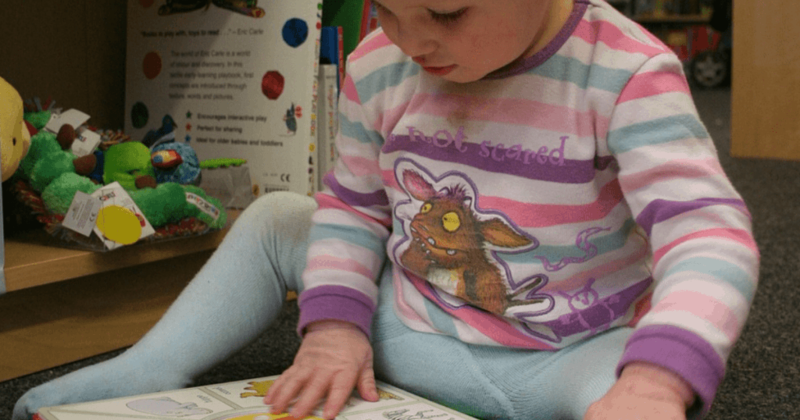 The programs keep your toddler interested and they are always learning new things along the way, it is so important though to work with them afterword and reinstate what they learned that day. If you as a mom can make learning fun and engaging, your toddler will learn a lot more and may develop skills that surpass the other kids when it comes time for school. It seems like kids have to be able to read and write paragraphs in kindergarten now lol so if you can get your child into learning at an early age you will be ahead of the game!! These are the products that our son plays with all the time and loves! I think they are a great investment and not very expensive and are great for fun activities to help your toddler with speech. We own a lot of Melissa & Doug products because they are so good, hold up with heavy use and are educational and fun at the same time, we love the products they have and use them all the time!! I didn’t realize how many we have until I started writing this post but I’m only going to talk about the ones that help with vocabulary and learning. We have the magnetic alphabet and numbers that we work with him on and he loves hanging them on the refrigerator or dishwasher and saying the letters or numbers as he puts them on. If you don’t have any of these they are really great for teaching your toddler to spell, count and say letters and the bonus of it is that you will use them for years not just for a few months!! If your child gets into these like ours has then they will work great for helping your toddler to talk more and say new words they learned. 2. We also have the Melissa & Doug shape sorting cube which promotes problem solving and color and shape recognition, our little guy loves it sometimes and other times he throws a tantrum because he is frustrated with the shapes he isn’t as familiar with. What seems to work when he does this is to show him calmly where it goes and then have him do it, this doesn’t always work out he sometimes just say no and walks away mad. 3. Latches Wooden Activity Board by Melissa & Doug is a fun way to build fine and gross motor skills, go over colors and count with fun animals hidden inside each door. Some of the latches are hard for a two year olds fingers but with a little help they will get the hang of it and be able to play with little assistance. 4. Melissa & Doug car carrier truck and cars wooden toys is what our son uses to reenact the color videos that he watches and it also helps that he is totally obsessed with cars!! These help with motor skills and imagination and I have seen his imagination come alive the past few weeks now. 5. Melissa & Doug Wooden peg puzzles with pictures under the pieces to help your child figure out where they go and they can say the names of the animals or objects. These aren’t the exact ones that we have. We have a train one with trees a sun and a dog and also one that has farm animals like this one but bigger. We love doing puzzles and our son is getting really good at putting them together and saying what is in the puzzle. Great educational tool to increase your childs vocabulary. You can check out more Melissa & Doug products on Amazon and find ones that your child will absolutely love and have fun playing with over and over again. The best part is that they are quality toys that hold up with the roughest toddler so you don’t have broken toys after a few months. I will have to write another post of all the products we have from them that are so fun and great tools for teaching your child as they grow and learn more!! Along with the YouTube you can also help your toddler by saying everything that is happening if he throws a ball say, “The ball bounced way up high and then rolled to the door“. Something that is more descriptive and gives actions for the words he/she is using, this helps them put sentences together and word groupings. Using simple flash cards and seeing if he recognizes what is on them and can say the names or even colors. You can also help by singing easy songs to your toddler like nursery rhyme songs or repetitive ones like row row row your boat. Talk to your toddler about activities you are doing such as putting on clothes, or taking shoes off, explain the steps you are taking. Go outside and point out different animals, bugs, birds and explain what they are doing using short sentences and emphasise key words. Play games where you take turns like building with colored blocks or rolling cars back and forth, try to encourage conversation. Use sensory play to help describe what you see, feel, hear, taste, smell and touch. Allow your child to play with children of different age groups which helps with learning from older piers or leading the younger ones. 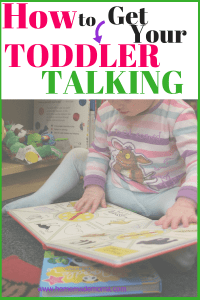 Talk baby talk and dumb down what your are saying to your toddler, this will not help your little one learn. Your child needs you to speak normal so that they will understand in context what you are saying and be able to repeat it back to you. If your child is saying words back to you that are close but aren’t pronounced don’t make a big deal or praise it just keep up with regular conversation. Freak out and try to push your child when they aren’t ready to move forward and in turn you get frustrated when they aren’t getting things. Panic and take your child for a diagnosis of speech delay without looking at what you can do to help first and then when you can’t do anything more go see your doctor for help. It’s very normal for a 2 year old to know 20 words and words are counted as sounds and grunting as well as a short word sentence, so you shouldn’t be alarmed if this is all your 2 year old does right now it’s totally normal. 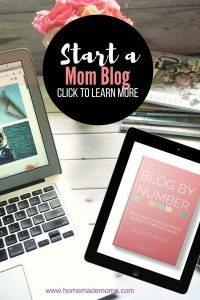 Every toddler is different so what works for one may not work for another but it’s worth a try and you may be surprised at how much your little one learns in a short amount of time. It can’t hurt to try it out and see! If it doesn’t work try something else they may be interested in. I think a big part of it is having them interested in what they are learning, without that interest they may not pick up on anything so it all depends on your child. Be patient momma your child will be speaking in full sentences soon enough and then you won’t have a single moment of silence haha so enjoy what you have and encourage them as they grow and learn, this is just one stage in their life and it is important to enjoy the moment because it is over all to soon!